To give sales people the agility and power to find answers, engage in meaningful customer conversations, and deliver the right impact every time. Salespeople need a new set of capabilities that enhance the selling process. Going beyond the traditional approach to CRM sales software, SAP Hybris Sales Cloud maximizes sales effectiveness of your sales reps to engage and win customers like never before. Give your sales reps the insight they need to engage in meaningful customer conversations and take the right action. 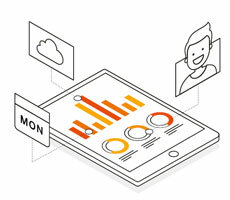 Help them understand your customers’ unique challenges and industry with access to customer information, real-time analytics, and social sales software. THE ABILITY TO SELL ANYTIME, ANYWHERE, ON ANY DEVICE. Be Productive, even when you’re offline. Spend less time on chasing down information and more time with your customer. to provide a complete customer view and flexibility to create orders, quotes and service tickets on-site. in the context of their accounts and opportunities to help them engage and connect with customers in a personal, relevant way. PREDICTIVE ANALYTICS AND INSIGHT TO INCREASE CHANCES OF WINNING. See realtime-visibility and predictabilty into your business, enabing you to make changes in realtime and guide and coach your sales team. SAP Hybris Sales Cloud helps you and your team sell more, anytime, anywhere.